NGC 7098 is an unusual galaxy in the southern constellation of Octans about 108 million light years distant with an apparent size of 4.3 x 2.4 arcminutes. North is to the lower right in the image. It has a beautiful central bar that is terminated on each end by curved ansae shown as small, bright streaks, like handles. Ansae are density enhancements at the end of the bars, and are actually quite common, according to Martinez-Valpuesta et al. (“A Morphological and Statistical Analysis of Ansae in Barred Spiral Galaxies”, Astron. J. v134, pp 1863-1869, Nov 2007). Surrounding the bar is an inner ring, which may be comprised of four folded spiral arms. Then, there is a gap and an outer ring that appears to be the result of the folding of two spiral arms. There is evidence that new star formation is occurring in the rings, but not in the nucleus as evidenced by the absence of dust lanes. NGC 7098 is referred to as a double barred spiral galaxy. There are many background galaxies in this very deep image, as well as dust throughout the field. 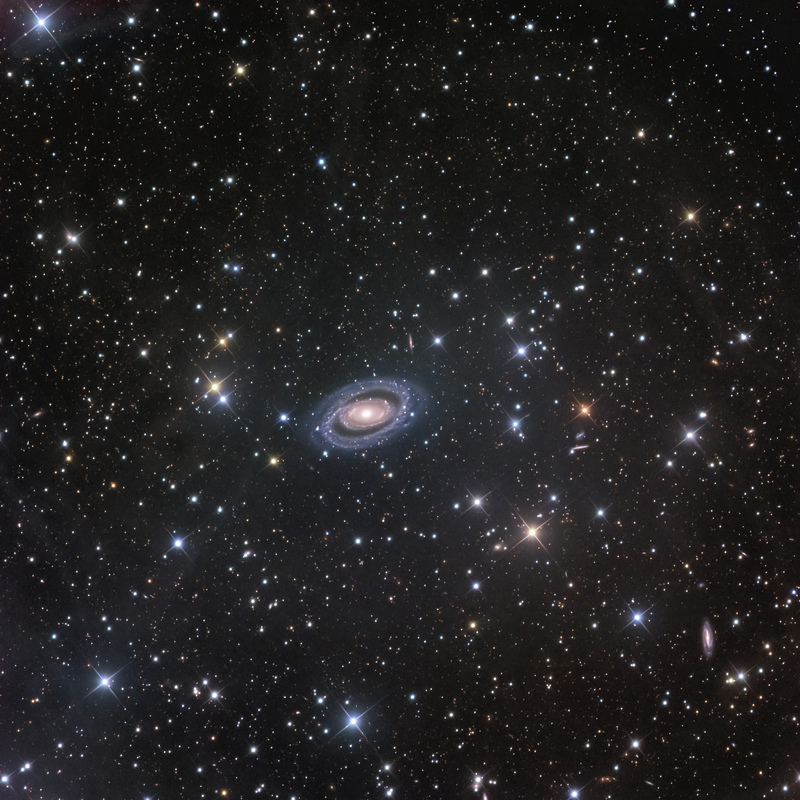 The small, spiral galaxy near the bottom right of the image is ESO 048 – G 007.